Tim Sykes’s weekly videos have taught thousands of people how to trade better. And for just $149.95 a month, you can get Tim's real-time alerts as well. Want to test the waters? Tim’s alerts are available as a standalone package for only $74.95 a month. Do you have what it takes to be a great TRADER? Your broker stinks! You can short ANY stock down to 1 penny/share as long as your broker can find shares to short, this is my gift and curse. My strategy is ideal for those with accounts between $500 and $500,000, not for those with $50 million or $500 million, it's a poor man's strategy, but the good news is my best students profit upwards of $50,000 and $100,000 per year so there is still solid money to be made in this niche. 2) If your strategy is so good, why do you teach and not just trade? As I explained above, my strategy does not work with $100 million or $1 billion which is what most hedge funds have because the companies are small so the profit opportunities range from $1,000 to $200,000... still good money to a lot of people, which is why I teach individuals. And thanks to the success of my TV show "Wall Street Warriors", I realized there was great demand from people who don't maximize their profits or continually lose trading penny stocks so the opportunity was great to correct all the misinformation out there and help teach people to profit more. Teaching is usually for those "who can't do," but in my case, I "can do" and my students reap the rewards by learning from a totally self-taught and self-made millionaire trader. My teaching business pulls in millions of dollars per year now with thousands of students in over 60 countries simply by my being honest about how I trade - both my successes and mistakes. I'm extremely fortunate to have found a business I love and that is honest, rewarding and fulfilling both for my students and myself. 3) Aren't penny stocks dangerous? Yes, but over the past few years' even investments previously considered "Safe" like mutual funds have been discovered to be rather dangerous. Despite my making millions of dollars, I am nowhere near a great trader - as my longterm students will attest - and the key to my protecting my account is that I cut losses EXTREMELY quick if I'm ever caught with a stock heading in the wrong direction. Also, when you have a small account, you need to take more risks in order to be able to grow your nest egg exponentially to make it worth your time even investing/trading in the stock market. I know too many "safe" investors who spend countless hours researching and debating and yet their yearly profits are less than that of a part-time Starbucks barista aka not worth the time! 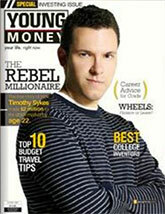 4) What kind of teacher is Timothy Sykes? 5) Which plan should I choose? My most popular plan is my PennyStocking Silver plan as you receive access to not only my chatroom, daily watchlists and real-time trading alerts, but you also receive daily video watchlists, access to my 4,400+ video lesson library and new video lessons weekly!